Proof that the word Raith has/had a wider use than just for the name of the local football team. This was the Raith cinema and is now some sort of church. It’s situated in Links Street in what is known as Linktown, which maybe once was a separate entity from The Lang Toun but now there is no gap between them and it’s just another part of Kirkcaldy. The curly flourishes on the entrance are about all that makes this Art Deco, but their Eastern influence is one of the hallmarks of Deco styling (cf the Hoover Factory and India of Inchinnan.) Those apart it’s a pretty bog standard barn of a cinema building. I’ve no idea what it looks like inside or if there were any Art Deco detailings in the interior. Do you suppose that when folk exited the cinema after watching a musical they were dancing in the streets of Raith? See a similar photo at the Scottish cinemas website. Curiously just along the same street from the former Raith there is another unusual religious building; for Scotland that is. A Coptic church. You can occasionally see the priest in Kirkcaldy High Street, in his full beard, ecclesiastical hat and black robes. Thanks for dropping in, Jane. When was it a ballroom? During or after the cinema period? Before I came to live in Kirkcaldy anyway. Hello. Your photos show the old Burma dance hall, not the Raith. The Raith was on the Esplanade, demolished many years ago and now has a block of flats in its place. Thanks for the information. Not being a Kirkcaldy native I wasn’t aware the Raith had been demolished. I was relying on the Scottish cinemas website (http://www.scottishcinemas.org.uk/scotland/kirkcaldy/raith.html) where it gives the building I showed as the Raith Cinema. 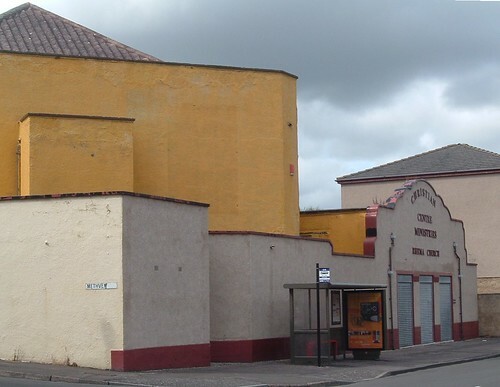 The Raith Ballroom opened as a dance hall around 1963 after it was a cinema. It closed around 1974 when it lost its drinks licence. 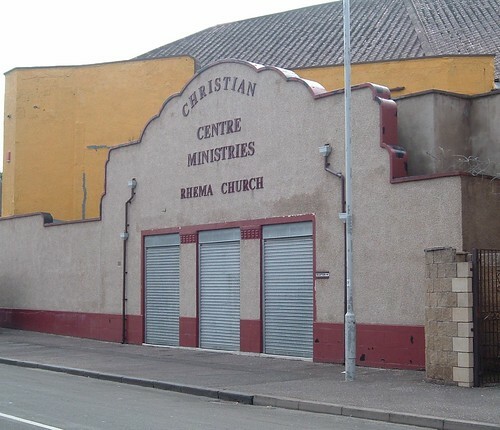 It became and still is the Rhema church located in Links Street. The Burma Ballroom (later known as Jackie O’s amongst other names) was located on the Esplanade and has been demolshed to make way for housing. Thanks for this. It’s always good to hear more of the history of the buildings I feature. My knowledge of Kirkcaldy’s past is limited. I only moved there in the 1980s. Thanks also for looking in and taking the time to comment.